What is your coaching style? Why do you coach? What do want to accomplish? Are you going to be a good practice coach or diss practice and just play the games? Are you going to be a win-at-all-costs approach or try to develop players to someday reach high school baseball? Are you jounaling or reflecting on questions like this? We can do tremendous good OR dreadful harm to young baseball players. Only one in five coaches has recieved any training on coaching and managing youth ball players. Spend some time really reflecting on what type of coaching approach you are going to have. See how to send your players to the Major Leagues. The local high team is your major league team. Only a select few make it this far. See how to build a minor league system. Pre-Season Meeting is a must. Every players parent's must attend so you go over your procedures, policies, philosophy and introduce your staff. 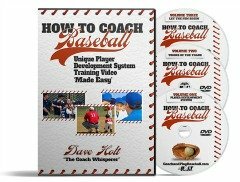 Revolutionize Baseball Coaching - DVDs NOW HERE! I am starting to produce a series of DVD's on my baseball development training system. Our current player development system does not work nearly as well as it should. Why? Too much emphasis on winning and not enough focus on training baseball players. The DVD's videos will give you and your entire youth baseball league a real live on-camera system to follow in order to properly approach youth baseball with the greatest return on investment. You can ruin careers unless you know what to say and when to say it. Hitters have to hit or it is GAME-OVER and you are quickly out of baseball. You better get this part right. If a friend DID forward this to you and if you like what you read, please subscribe by visiting 459 Essential Tips to Coach & Play Baseball and get this 45 page eBook at no cost. You get a copy just for signing up for this newsletter and enjoying browsing my site! I’d love to hear form you . Just reply to this zine and tell what you think! I’m here to help where I can! Until next time, Thanks for your service to Baseball!